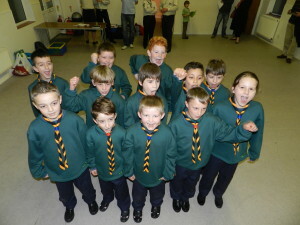 33 new Beavers and Cubs join in one evening! Two new Scout sections, Beavers (aged 6-8) and Cubs (aged 8-10) have opened in Branksome after a demand from young people and parents in the area. The new sections, which operate at Burden Hall on Alder Road started in January and are called ‘Branksome St. Aldhelms – St Francis’, an extension of the group which already operates at Branksome St. Aldhelms Church. 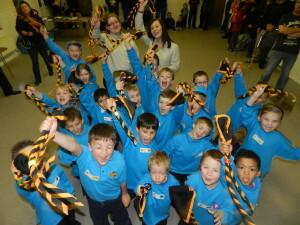 Last night (Thursday 3rd April), 21 new Beavers and 12 Cubs all made their Scout promise and became officially invested into their new Scout group. Both sections meet on a weekly basis and take part in a wide range of activities including games, crafts, challenges and as the summer comes around, plenty of outdoor activities. Scout Leaders in Poole decided to open the new sections after seeing a high demand in this area on their waiting list, which currently has over 300 young people on. A new Scout section (aged 10-14) is also set to open in June, giving capacity for another 20-30 young people to join the adventure in Poole. Beavers were off on a hike!